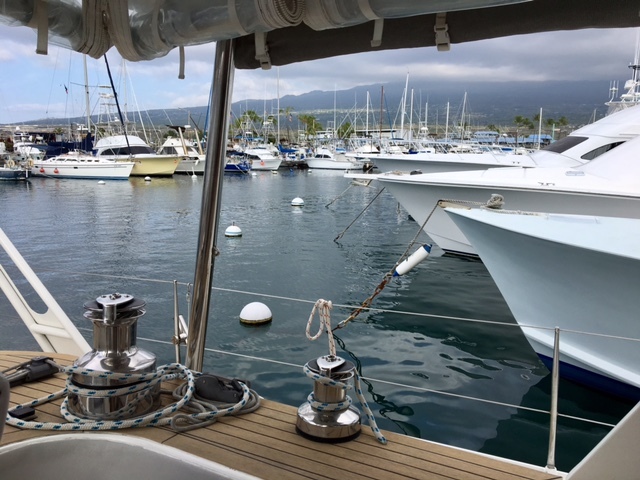 Honokohau small boat harbour, meeting up with our Penrhyn sailing friends, who have their boat just a couple of slips further down the dock. On the way into the harbour we saw some spinner dolphins performing for the tourist boats. Fun! 2 weeks after having arrived in Hilo we're now sailing around the bid island in the south and head over to the west coast. The time on this side has definitely been dominated by the volcanos. I just LOVE them. I stayed out many nights to take pictures with the stars out. On Mauna Kea and of Kiluea. Having (near) full moon out changed my original plans but still gave me nice shots, that all still require processing. We made new friends (Bob and Carol, an ex-sailing couple with a botanical garden and photographer Harry), we met our Penrhyn sailing friends, we enjoyed fresh garden veggies, sun& rain & white christmas, watched lava come out of the earth and so much more. We just left out beaches, lately because of my wound. We're sailing over night and hope to see some whales out there as they are already here. Yes, it's whale season again :-) And we'll pass by the lava flow in the dark, that will be exciting. Too bad there is no flow going into the water right now.